Thanks for this valuable knowledge we are getting on this site .. Thanks to the team behind who works hard to share this information to the readers. Matheran has got a great monsoon this time. North and cebtral parts of konkan have rocked. Great efforts by team members of vagaries of weather in compiling and presenting such data within no time. Tejas and Abhijit and other vagarians really appreciate your time efforts and energy. Highest 24 hrs rainfall 638.2 mm on 17 June 2017. GSB sir grear efforts as always sir. 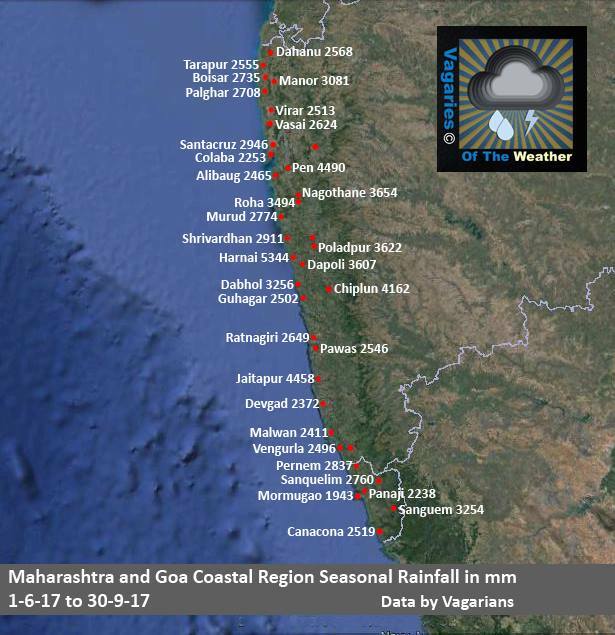 Excellent efforts by all the Vagarians involved in compiling and presenting this rainfall data! Lets see how much rain do we get in the transition months of October and November (non NEM regions). Would be interesting to watch out for tropical activity in north Indian Ocean basin. Konkan & Goa subdivision is getting excess rains in the monsoon year by year. 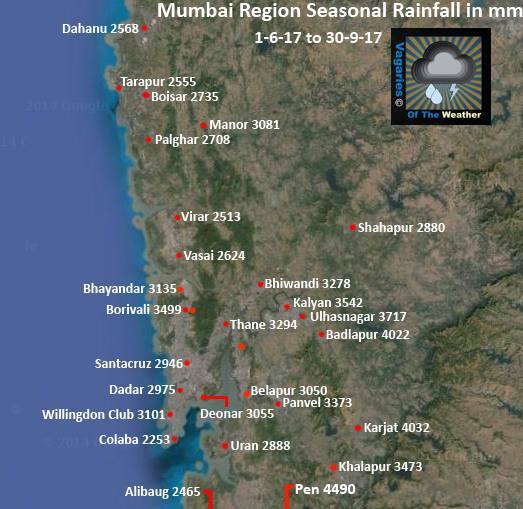 Look at imd hydrology website and check statistics of seasonal rainfall from 2010 to 2016. 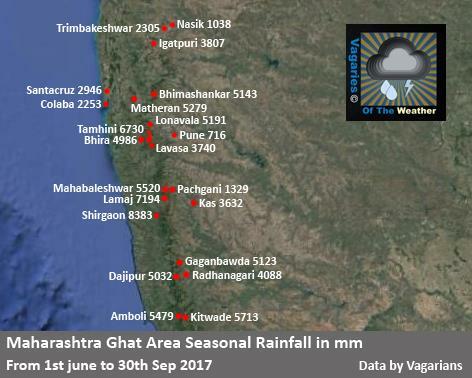 Konkan & Goa got 4 excess rainfall years, 2 Normal and 1 deficient. Konkan/Maharashtra is becoming wetter - maybe not all years but leading all other states including erstwhile giants like Karnataka,Kerala leaving them far behind. Apparently climate changes + increased green initiatives by MAHA govt by massive tree plantations (50 crores) is a good asset. Anyway time will say....MAHA also has issues but comparatively better..
Everything that has a temperature gives off electromagnetic radiation (light). The sun is extremely hot and has a lot of energy to give, so it gives off shortwave radiation because shortwave radiation contains higher amounts of energy The earth is much cooler, but still emits radiation. Earth’s radiation is emitted as longwave because longwave radiation contains a smaller amount of energy. Shortwave radiation (visible light) contains a lot of energy; longwave radiation (infrared light) contains less energy than shortwave radiation (shortwave radiation has a shorter wavelength than longwave radation). Solar energy enters our atmosphere as shortwave radiation in the form of ultraviolet (UV) rays (the ones that give us sunburn) and visible light. The sun emits shortwave radiation because it is extremely hot and has a lot of energy to give off. Once in the Earth’s atmosphere, clouds and the surface absorb the solar energy. The ground heats up and re-emits energy as longwave radiation in the form of infrared rays. Earth emits longwave radiation because Earth is cooler than the sun and has less energy available to give off. Ever dependable GSB.. Superb as usual... Good summary of rainy season. A UAC is likely to form off the Maharashtra coast on 7th Oct. May descend as a Low in the same position. Will decide the further withdrawal of Monsoon line in a day or two after seeing the development of this "to form" system. An isolated thunder shower possible in Mumbai in some parts on Monday 2nd Oct...mainly no rain on 3rd and 4th October. The UAC may bring some rains on 7th Oct...will be reviewed again. parshuram: this what what we see is the initial formation of the UAC formation which i mentioned in my comment above..which i expected on 7th..UAC is formed at 700 level sloping to 850 level Southwards.Since it has formed 3/4 days in advance , leyt us see the development. Just when we thought the Dry weather is finally here. We have already crossed our yearly rain quota by a mile!! Are we going to see rain / thunderstorms today? In all over maharashtra from 5 to 13 Oct.
Will it going to happen..? ?